It’s no secret that everyone loves to save money. But one of the questions people always ask is, “is it possible to save money on cleaning supplies? They’re so expensive!” And the answer to that question, in short, is yes. You can save money on cleaning supplies. We’ve got some tips and tricks to help you do just that so today we’re lining out our hacks to help you save money on cleaning supplies and still end up with a clean house. There are plenty of things that you probably already have around the house that you can clean with. Many kitchen items can be used as cleaning products which can save you time, money, and energy. Things like vinegar, lemons, baking soda, olive oil, vodka, and coffee grounds make great cleaning aids. Another thing is that most areas in your home can easily be cleaned using plain dish soap and water. You can use dish soap in your home as a window cleaner, surface cleaner, fruit and vegetable wash, and even to dust surfaces. It’s a great alternative. And it helps save money too. If you use paper towel in your house, you may want to think about switching it out for some reusable cleaning cloths. According to AOL.com, the average American spends almost $200 per year on paper towel if not more depending on the size of the household. You can buy a bulk pack of microfiber cloths on Amazon (or at your local grocery store) for less than $10. Microfiber cleaning cloths are great for cleaning nearly anything in your home. They work good on any surface and can be color coordinated by rooms, chore, person, and more. And when you’re finished using them all you need to do is throw them in the laundry basket until it’s time to wash them. If you’re one of those people who doesn’t like to switch it up and you want to keep on using the same cleaning supplies you’ve been using, one way you can save money is by clipping coupons. Sign up for email newsletters for your favorite brand and wait for them to send you coupons directly to your inbox. Another thing you can do is look at sites like TheKrazyCouponLady, RetailMeNot, and Coupons.com for coupons to clip from all of your favorite products. Clipping coupons is a great way to save money on any household item especially cleaning products. These days there’s a cleaning product for everything. The truth of the matter is that you don’t need one cleaning product for your dusting and another one for your surfaces. So if you’re really looking to save money on cleaning supplies and you have a lot of products under the sink, simplify your stash. There are three types of cleaning products you need in your home: window cleaner, surface cleaner, and bathroom cleaner. Anything else could just be taking up space and causing you to spend an unnecessary amount of money. 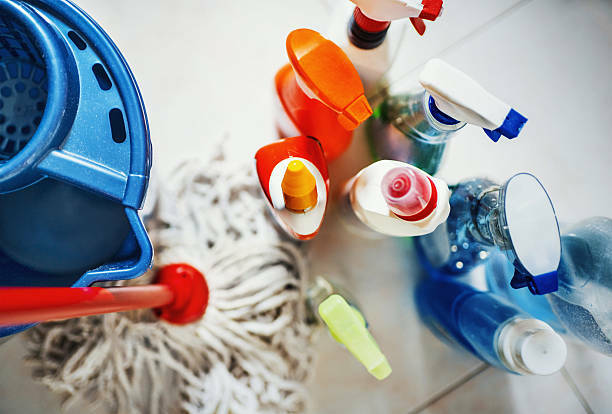 One of the best ways to save money on cleaning supplies in your home is to hire a housekeeper. Many companies provide you with a professional house cleaner and supplies to clean your house so that you don’t have to. Here at Spekless, it is our goal is to provide you with impeccable customer service. That includes having our professionals bring cleaning supplies to each and every visit. Hiring a professional can save you tons on cleaning supplies and allow you to free up some time to do what you love. As you can see, there are a plethora of ways you can save money on cleaning supplies. From using products in your pantry to discounts and coupons on your favorite items, there’s a way for everyone to save. When you modifying your cleaning habits and ensure that you are using the right amount of product, the results are astonishing. It proves that you can save time, money, and energy and still clean your home the way you like it.